Pilgrimage is a spiritual exercise that involves the whole man, not least his body – the “Temple of the Lord”. It should not surprise therefore that the exercise will test both your body and your spirit. Just as we prepare our souls to receive the Spirit of God on pilgrimage by practicing, in advance, prayer — the Pilgrim’s Prayer daily, as well as Songs of Pilgrimage; so too does every pilgrim need to prepare his body to receive the Holy Ghost worthily. Here follow seven helpful tips to preparing your body for pilgrimage. Walk, Walk, Walk – Make a habit of taking walks, preferably in varied terrain. Start by strolling a bit. Over time, walk short distances. If you can walk three-five miles each day by the last two weeks before step-off, you will have built a fair endurance, allowing your body better to acclimate to the day-long demands of pilgrimage. That is, to allow your soul to accept more readily — and joyfully — the purposes of the Holy Ghost on pilgrimage. Sing, Sing, Sing – Singing makes three days of pilgrimage not merely bearable, but possible — even joyful. And singing while you practice walking adds extra conditioning to your lungs, making for better endurance. Not singing — yes, even badly — will break any spirit, weak or strong, sooner or later on the road … but always sooner than later. Learn your ‘hot spots’ – In addition to endurance, walking distances also reveals where the “hot spots” are on your feet. Hot spots are places prone to developing blisters. When taking a long walk pay attention to your feet, to look for areas that are red, or ‘hot’ to the touch. Invest in some moleskin and learn how to apply it to the hot spots prior to walking. Moleskin reduces the friction on those areas and will help keep blisters at bay longer. Learn the signs of dehydration and heat exhaustion – During pilgrimage your body is the vehicle that will carry you to your destination. That means staying hydrated and learning the best ways to protect yourself from the elements. Bottled water is offered by pilgrim-organizers nearly every mile of pilgrimage: accept it humbly, whenever your supply is about to run out. Even in mild temperatures, every pilgrim needs upwards of three bottles of water every two hours. That’s about one and a half bottles an hour, at minimum. And when it’s hot, your body needs more. Way more. Know how to motivate yourself, sure. But learn to let others motivate you more surely. – The way of a pilgrim is unceasing prayer. (I. Thess. v, 17) Praying unceasingly on pilgrimage allows the body to cooperate with the mind in the mastery of the soul — all so that one may offer freely everything he is and has, even while suffering loss, to Our Lord Christ, through Our Lady. Pilgrimage tests you physically, spiritually and emotionally. 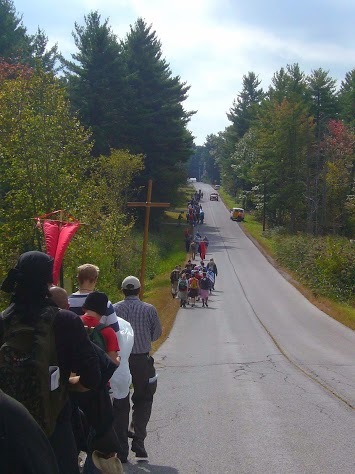 Pilgrimage teaches a pilgrim the joy of humility more quickly & effectively than during the times of everyday life. Pilgrimage allows one to give himself to God without being as deluded about who he is — and who God is. On the road, one soon realizes he can’t go on his merry way, alone and without help — from someone. There are of course moments of ‘triumph’, but soon enough defeats re-emerge. A pilgrim learns how to accept all things, especially suffering, to maintain a joyful outlook. Whether prayer, blisters, singing, telling (or putting up with) knock-knock jokes, aching legs & ‘pains in the neck’, or fellowship with other pilgrims — all can lead the pilgrim to his heavenly destination. Know your limits – Learn to be honest with yourself. When you can’t walk anymore, don’t. Learn the signs your body gives you when it’s telling you that you need a break. There is great humility to be found in honestly assessing your weaknesses. It will help you while on the pilgrimage road. While on pilgrimage don’t feel afraid or ashamed to recuperate in one of the shuttles, take the time in the shuttle to pray for your fellow pilgrims, or have a few moments of quiet spiritual reflection.